50 years ago today, on September 12, 1962, President John F. Kennedy delivered one of his best and most inspiring speeches. Arguably, one of the best in the history of the United States. Think about it. 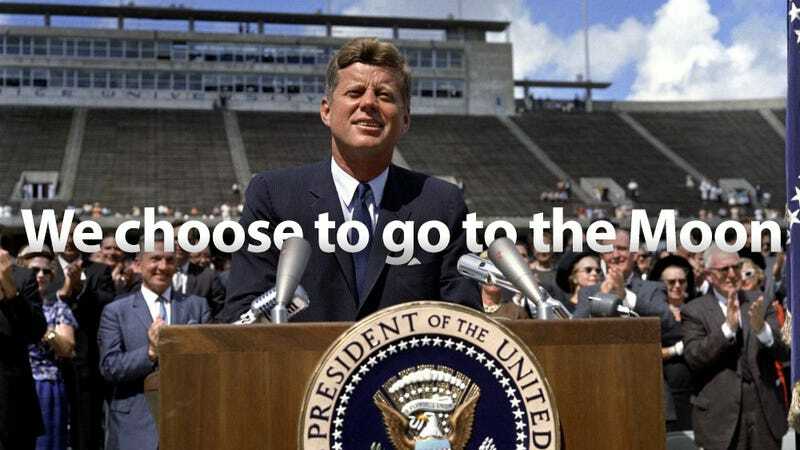 When Kennedy told NASA about the goal of sending humans to the Moon, there was no plan. Nothing. They didn't even know how the trip would be. There were some rocket engine designs, but no idea about how we were going to send astronauts, how we were going to protect them from the hardness of space, how we were going to make them land and return safely to Earth. There was no idea of orbital rendezvous. There was no lunar module. No command module. They had to invent it all from scratch. And in the process, the country spent $25.4 billion dollars. That government effort, the effort of everyone in this country, spawned entire new industries that are still carrying the lead of this nation today. America produced more engineers and PhDs than every other country in the world combined. The electronics and aeronautics industry exploded and, with them, other industries did too. New materials, new machines, millions of new high level jobs. It was phenomenal. And everyone, those who were directed involved and everyone else, benefited from it at an material and spiritual level. When Kennedy gave this speech, NASA had just started the lunar effort, testing the Saturn C-1 engine for the first time. Earlier that year, they put John Glenn into orbit on board the Mercury spacecraft Friendship 7, a first for the United States. The Soviets were still winning. We still had no clue if we were going to make it and yet we did it. To be sure, all this costs us all a good deal of money. This year¹s space budget is three times what it was in January 1961, and it is greater than the space budget of the previous eight years combined. That budget now stands at $5,400 million a year—a staggering sum, though somewhat less than we pay for cigarettes and cigars every year. Space expenditures will soon rise some more, from 40 cents per person per week to more than 50 cents a week for every man, woman and child in the United Stated, for we have given this program a high national priority—even though I realize that this is in some measure an act of faith and vision, for we do not now know what benefits await us. But if I were to say, my fellow citizens, that we shall send to the moon, 240,000 miles away from the control station in Houston, a giant rocket more than 300 feet tall, the length of this football field, made of new metal alloys, some of which have not yet been invented, capable of standing heat and stresses several times more than have ever been experienced, fitted together with a precision better than the finest watch, carrying all the equipment needed for propulsion, guidance, control, communications, food and survival, on an untried mission, to an unknown celestial body, and then return it safely to earth, re-entering the atmosphere at speeds of over 25,000 miles per hour, causing heat about half that of the temperature of the sun—almost as hot as it is here today—and do all this, and do it right, and do it first before this decade is out—then we must be bold.